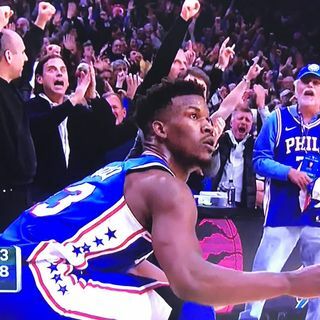 Thanks to the exploits of Joel Embiid and Jimmy Butler, Sixers Nation as a whole is feeling warm and fuzzy... at least for the next day or so. Can Brett Brown and his crew extend the team's longest winning streak of the season... and what does Kofi Kingston need to do in order to get a shot at Wrestlemania? Somebody said Bray should go Dusty Rhodes. It could work. Big E's Twitter video yesterday was a shoot unlike nobody's business. The Eagles should wrap up the NFC East by Halloween. Magic Johnson is a horrible talent evaluator. That's the bottom line. Mark Jackson saying stuff like that is why he's stuck next to Jeff Van Gundy. The Sixers haven't won 50 games in consecutive years since Oran Juice Jones kicked that girl out of his house.